What are Enterprise Mobile Applications? Defined by Kony.com as a “mobile application that is used to solve enterprise problems,” these apps use a complex software platform to bridge the technology gaps at a company, helping it to go where it may not have gone before. A purpose-built enterprise mobile application is able to be deployed on many different networks, devices, and operating systems. That last point is critical, as companies today are looking to reach their employees where they “live” – taking advantage of the trend for team members to use personalized mobile devices to access corporate applications and data (a process called Bring Your Own Device, or BYOD). For aficionados of the Star Trek series, it would be hard to dispute the importance of the Starship Enterprise. Designed to go where no one had gone before, the Enterprise was loaded with best-in-class technology; it is a tool that made its humans more clever and agile and was a vessel that helped solve the problems of deep space. Like its fictional counterpart, an enterprise mobile application can have world-beating, transformative properties for those who experience its power. 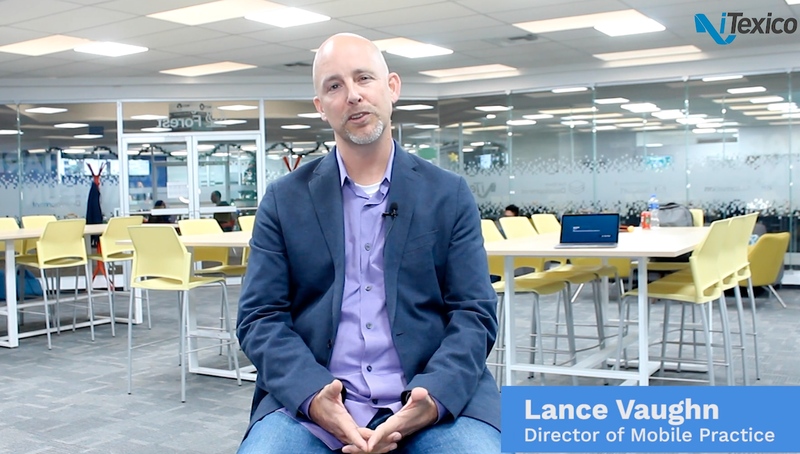 Why is it Important to Build an Enterprise Mobile Application? Indeed, any company can benefit from investing in an enterprise mobile application. An enterprise mobile application can help organizations be more efficient while eliminating the expense of purchasing and providing company devices to team members. Dynamic Collaboration: Different departments will find collaboration to be improved and information to be more accessible. Easy Access to Data: Employees can access data from anywhere, and at any time, as long as they have connectivity. Better Customer Service: Enterprise mobile applications can deliver enhanced customer support since all employees can easily access official information. Simply, enterprise mobile applications can lead to quicker response times, and better resolution of issues. Offline Access: Enterprise mobile applications can be built to automatically synchronize information to mobile devices, allowing employees access even when they are offline. Improves Efficiency and Productivity: Enterprise innovative mobile apps will increase operational efficiency while improving productivity among employees. Reduced Costs: Improving efficiency leads to a reduction in overall costs. By simulating human conversation, AI tools such as voice-based assistants and chatbots can enhance customer service for a company. Existing examples of this technology that has people talking to computers include Facebook Messenger Bot and Amazon Alexa. Engagement and business operations got a further upgrade back in 2017, when AR and VR made a splash on the mobile enterprise application scene. Imagine an environment where, without having to use hands, your employees can see their required digital information without really moving from their desks or tapping keys. Retailers can use such AR technologies to view retail inventory and sales data. And, VR has even made its way into video conferencing, allowing greater productivity to result from these sessions. Industries such as retail, finance, automobiles, and airlines are finding that blockchain technology can be the perfect addition to their enterprise mobile app solutions. 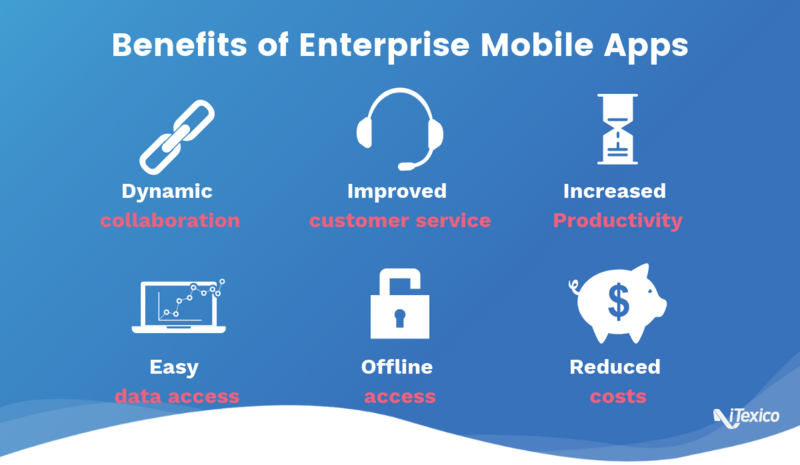 In short, if you haven’t considered the organizational benefits of enterprise mobile applications, now is the time to do so. These innovative apps carry with them myriad ways to make your company more efficient, productive and profitable. If you need help strategizing your enterprise mobile applications, please contact us here at iTexico.